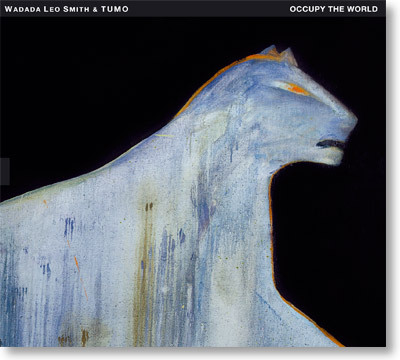 Occupy the World features the legendary composer and trumpeter Wadada Leo Smith together with TUMO, a new improvising orchestra that is assembled specifically for each project, in its first appearance. The 22-piece orchestra performs five extended compositions by Smith, including "Occupy The World For Life, Liberty and Justice", his most extensive recorded composition to date, that was originally inspired by the Occupy movement. The four other compositions included on this double-CD were also recorded here for the first time. Wadada Leo Smith´s previous recording, Ten Freedom Summers, was recently short-listed for the Pulitzer Prize in music and Occupy The World presents an equally significant addition to the ouvre of one of the most important creative musicians and composers of our time. TUMO is made up of leading improvisers in Finland and the Nordic region, many of whom have recorded for TUM Records with various groups before. In addition to the principal soloists, Wadada Leo Smith on four compositions and bassist John Lindberg on one, featured are trumpeter Verneri Pohjola, trombonist Jari Hongisto, saxophonists Mikko Innanen and Fredrik Ljungkvist, flutist Juhani Aaltonen, pianist Seppo Kantonen, harpist Iro Haarla, accordionist Veli Kujala, guitarists Kalle Kalima and Mikko Iivanainen as well as drummers Mika Kallio, Stefan Pasborg and Janne Tuomi, among others.